Every March is designated as Multiple System Atrophy (MSA) Awareness Month and provides the opportunity to educate the world about a rare and fatal neurodegenerative disorder. Affecting at least 13,000 middle-aged Americans and thousands more globally, multiple system atrophy currently has no cure. The Multiple System Atrophy Coalition today announced the kickoff of Multiple System Atrophy (MSA) Awareness Month. In 2010, March was first officially declared as MSA Awareness Month. Since then, this annual event has grown to be a rallying point for the multiple system atrophy community, when thousands of patients, caregivers and advocates internationally join together to spread Multiple System Atrophy awareness and raise funds for the cause. The nation's oldest and largest nonprofit dedicated to the disease, the Multiple System Atrophy Coalition, is encouraging everyone to support MSA Awareness Month to better educate the public who may not know about the rare disease, and to aid in fundraising efforts for increased research, advocacy, support and education resources for patients and families affected. The Multiple System Atrophy Coalition honors this month, which blossomed from an idea first put forth by Bob Summers of Murfreesboro, TN whose wife Susan was afflicted with multiple system atrophy and passed away after a valiant battle. In his first Facebook post proposing the idea, he shared, “the first day of spring falls during this month, a time of renewal or rebirth. It seems to be a fitting time of year to reflect and dream big about our role to promote awareness and raise money for the much needed research.” As a former high school basketball coach, Bob Summers also suggested that all should wear the color purple during this month to emphasize the collective team aspect of raising awareness. Host a fundraising or education event or create an online fundraising page to share with contacts. Show support for those battling MSA by wearing purple every day in March. Be sure to tell others why purple is being worn. Update personal social media platforms with MSA awareness cover photos or badges; share personal stories or posts from the MSA Coalition to show support. Write to local media about MSA Awareness Month through an editorial, blog post, or letter to the editor. The disease takes many things from patients including their ability to work and be productive, to do simple daily activities like walking to the mailbox and eating without help, and ultimately life itself. 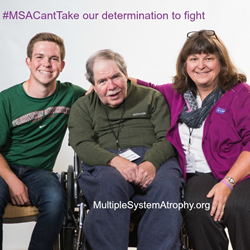 The #MSACantTake campaign is intended to emphasize what Multiple System Atrophy Can’t Take from those affected by the condition, such as the will to fight, striving to make every day count, and the love of family and friends. Please join the conversation by using the hashtag #MSACantTake and sharing personal stories publicly on Facebook, Twitter and Instagram. For the remainder of 2016, the MSA Coalition’s planned highlights include selecting the recipients of the next round of funded MSA research grants, sponsorship of the fifth International MSA Congress for scientists and physicians in Salerno, Italy (April 22-23) and the next Annual Patient and Family Conference in New Orleans (October 14-15). To donate via a mobile phone text - March4MSA - to 41-444.